Do you have a smartphone or tablet connected to the Internet as you’re traveling down the road? We hope so! That is, if you’re in the passenger seat! It’s hard to believe that they’ve only been in existence for 6 years. Our Android phones have been helping us with all our travel information needs for nearly 4 years. Recently, our iPad mini has taken over. Even though it’s only been a few years, I just can’t imagine how we ever traveled without our smartphones and tablets. 2. What is the price of Diesel at each station. It also has the price of regular and Premium, but I leave it set to Diesel – by using the list view and tapping the Diesel tab. Now, when I’m on the Map view, if I see a price listed, I know that station has Diesel available. The beauty of having this information on a smartphone/tablet app is that it knows where you are, and can show you the gas stations nearby. You don’t need to even know what state you’re in, let alone have the zip code handy to look stuff up. If you see a station with a price you like, you can simply tap on it, tap ‘Directions’ and it will open up your maps app all set to start navigating to the station selected. On iPhones/iPads it will open Apple Maps, on Android devices it will start Google Maps. Gas Buddy is the most useful to us when we’re about to cross stateliness. We will often check just to see if fuel prices are higher or lower on the other side. That tells us whether we should top off before we cross, or wait. Once in a great while, the price displaying on GasBuddy is different from what we pay at the pump. In those cases, we login with our GasBuddy username and password and enter the price we just paid. The next time we look, the price has been updated. This is how GasBuddy stays so accurate – it depends on the crowd of people who are using it and making these reports. “Crowd-Sourcing” is what it’s called. If you sign up for an account (it’s free) you can even earn points and win prizes like $250 gas cards. The more prices you report, the more you earn. GasBuddy has a regular website (gasbuddy.com) where you can look up prices for anywhere, it is also available for all popular smartphones: Android, iPhone, Windows Phone and Blackberry. One tiny complaint … it doesn’t have an iPad specific app, you need to install the iPhone app and it will only display in the vertical orientation. It looks like you have an iPhone inside your iPad. If you tap the 2X button it will expand to fill the screen. Since it uses the GPS, your iPad must be a model with cellular connectivity – the Wi-Fi only iPads do not have GPS built in. If you buy gas, or diesel, you need GasBuddy! We are fulltime RVers, and this past week we’ve had to travel cross-country, starting in Nevada and ending near Washington, D.C. It’s no surprise that we’ve stayed on the Interstates most of that trip, so we decided to check out iExit (iexitapp.com.) If you’re familiar with the book “Next Exit” you know the basic concept, a listing of all services available at each Interstate Exit. Now, put that on an iPhone/iPad or Android device so that it knows where you are, make it easy to simply tap on an Exit number to show all the details, and you have an extremely useful app. I expected to get good info on gas stations and restaurants, what I didn’t expect is to get nearby campgrounds as well. I have been using Allstays RV and Camp for most of our campground-locating needs, but, on this trip we were interested only in campgrounds that were very close to the Interstate Exits. iExit came thru. Unlike most of the Apps we use, iExit is not free. It’s $.99. If that’s too much, then there’s something wrong! It’s great information and oh-so-easy. Now, if it would only combine the GasBuddy price information, I’d be all set! Such a bother to have to switch back and forth between apps! Woe is me. Published by MrsGeek, in Blog. 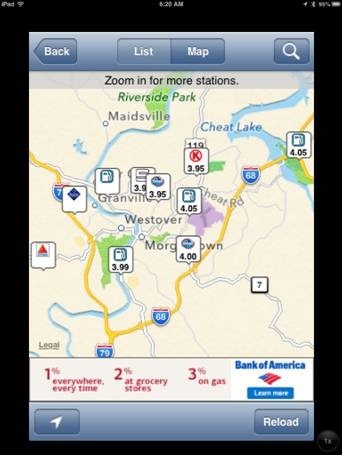 Tagged with Android Apps, Apps for Travelers, Gas Buddy, iExit, iPhone/iPad Apps. which ALLSTAYS do you use? I see your comment about the ipad cellular option is the only one that has the gps. What if you don’t want to use the cellular connection would the gps still be operable? We are trying to keep the mounting cell phone bill costs under control. Wifes Ipad has the cell connection and am thinking about getting a refurb ipad, probably the retina with only wifi. If I bought the dual wifi/cellular but not turn the cell connection would the gps still work? Jim, YES! The cellular-capable iPad will have GPS, but you don’t need to turn on a cellular plan. I’ve been an inactive member member of yours for a couple years (good intentions,lack of time.) This post caught my eye because I decided that the solution to my dislike of smartphones was a small tablet. I finally (a month ago) bought Verizon’s Samsung Tab 2 7.0 with 2GB of data per month (not a share-everything plan). I’m not using it as much as I should yet, but my question is how do these apps work in terms of data usage. Does the GPS work independently, or does it use data constantly? Do the gas and exit apps use data constantly? How much? Have you been able to monitor your usage? I’ve used gasbuddy.com (and its Detroit area-specific website detroitgasprices.com) for years on my computer, but never an app. I’ve never done an app yet and not quite sure how to access it. Kathy – Jim and I were just discussing how some people really want to keep their ‘dumb’ phones and that getting a small tablet with a cell plan would be a great option!